Why settle for the boring playground swing, when you can install a flying saucer swing for your family in your own backyard?! Flying saucer swings usually can accommodate more than one kid so your child and their friends can ride at once and pretend to go on an adventure. It can even handle adults which opens up a lot of possibilities for playtime and promote social interaction. Don’t forget to check out our top picks from sensory therapeutic swings. There are several types of flying saucer swings available today. How do you choose the best one for your yard? Just as you would in a regular outdoor baby swing, you need to consider the stability of the swing, comfort, and the overall design. We’ve made a list of some of the best models that you can compare to help you narrow down your choices and make an informed decision. Our best pick is the Blue island Tree Swing-Easy. Perfect for the whole family, it is large enough for you and your kids. You can play together and have quality bonding time. Children can stand on the swing which is great for imaginative play to develop their creative thinking or lie down and just relax under the shade during the day or watch the stars at night time. This flying saucer swing is one of the large sizes. The 40” diameter provides enough space for your kids and their friends to play together. The steel frame provides excellent support so you are assured of your child’s safety and it hangs on strong straps that can handle heavy duty play. The Blue island Tree Swing-Easy is tough and durable, but it offers great comfort with its 600D Oxford fabric cover that won’t irritate your child’s skin. 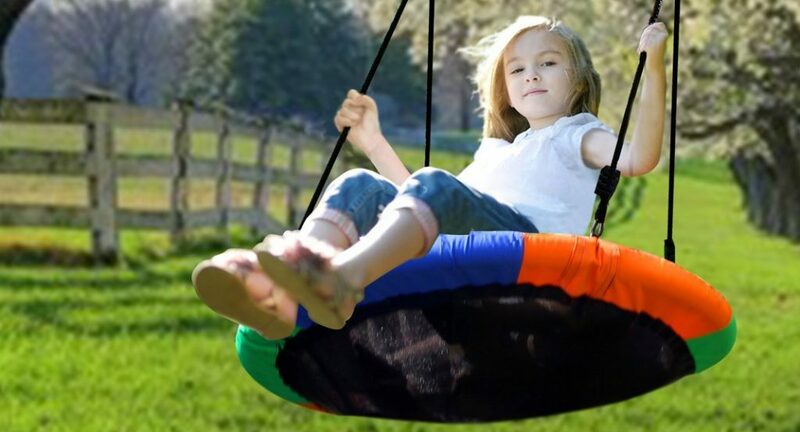 It doesn’t have any rough spots so you or your child can comfortably hang your legs over the edge. The straps and the frames have a detachable design so the swing is very easy to put together and quickly disassembles for easy storage. An even bigger version is the Royal Oak Giant 40″ Saucer Tree Swing which has a massive 400 lb capacity. This flying saucer swing guarantees not only your child’s safety but also tons of fun! This swing has been rigorously tested and received a rating of 400 lb capacity. It can handle one adult and/ or multiple kids at once with its durable industrial steel frame and 600D Oxford polyester fabric. It is also weather resistant which means it can withstand rain and snow so you don’t have to worry about leaving it outside. The ropes are adjustable and have a 2ft range so you can easily find the right height and adjust it to whoever is using it. If you want to get your kids or yourself to exercise without even knowing it, this flying saucer swing is the way to do it. It’s a great way to get them to play outside and leave their video games for a bit. The swing has a 40” diameter which makes it large enough for multiple kids to ride. It is recommended for ages 3 – 12 but there is really no age limit as long as the total weight is not more than 200 lbs. Unlike other saucer swings, the Royal Oak features a foam padding on top of its durable steel frame so it’s very comfortable to ride. The swing has a universal and versatile design so it’s quick and painless to install. You don’t need any special tools to get it ready for tons of fun! For those who don’t want a very large swing, this saucer swing from Play Platoon is just right for one or two kids. It’s smaller but has an excellent weight capacity so it means you or any adult can still ride it! The unique thing about this swing is that it comes fully assembled. This also ensures your child’s safety since you don’t risk making a mistake in the assembly. All you have to do is hang it on a suitable place. The swing has a 30” diameter which is smaller than other large swings but it can accommodate up to two kids and has a 400 lb capacity, which means it can also handle adults. This swing is made of materials that are built to last. Aside from the high-quality steel frame and durable fabric, it features a permeable material so the water easily drains when it rains. It can withstand most weather conditions. This full-size flying saucer tree swing includes a set of 8 Velcro removable flags to provide extra fun for your kids as they play. This is a large size saucer swing suitable for multiple riders and even adults! One unique thing about this saucer swing’s design is its steel frame are padded with Eva foam. So it’s comfortable not just on the fabric but also on the edges. The frames are made of commercial grade steel so it’s built to last and the fabric is a durable 600D polyester. The swing can be installed in any horizontal branch or pole and is very simple to set up. It also features adjustable ropes so you can easily find the right height. Buying a flying saucer swing is a form of investment so always consider who will be using it, not only at the moment but in the future. If you have a growing child, it’s good to choose a swing with a higher weight capacity so that they can continue to use it as they grow older. The size also matters and if you expect family and friends to come by often, it’s better to invest in the larger sized swings so that multiple kids can play at once. Ultimately, make sure that the design and the construction are durable, and always check the warranty from the manufacturer.